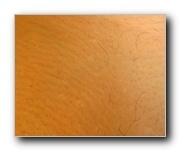 It has been nearly two months since my last laser hair removal treatment and dark hairs are beginning to grow back. If you click on the pictures to the right you can see there are many black hairs on my upper lip, in my underarms and in my bikini area. The hairs are very soft and thin. I still haven't shaved any of the areas since the last laser treatment. Also, all of the pepperspots in my bikini area have gone away. It took them a very long time to disappear, so I'm very happy that my skin in that area looks good again. I still have almost four weeks before my next treatment, so I expect to see a lot more hair growth. I am still debating whether I should call Ideal Image and ask for my laser energy level to be increased from 12J to 16J. I had a touch-up treatment at 14J without any problems, so I don't think there would be any scarring or other negative side effects from increasing the laser strength. The areas that were treated a few weeks after the treatment at 14J are still completely smooth. I am curious as to how these areas will look right before the treatment. Even if they are still perfectly smooth I want to increase my laser strength. The more I read about people's experiences with the Candela GentleLase the more I believe I need higher settings. I am a little upset about having my first two treatments at such low levels (10J). I was incorrectly categorized as Fitzpatrick skin type III when I am actually a II. Because of this they started my out at very low settings. I should have started at 14J not 10J.